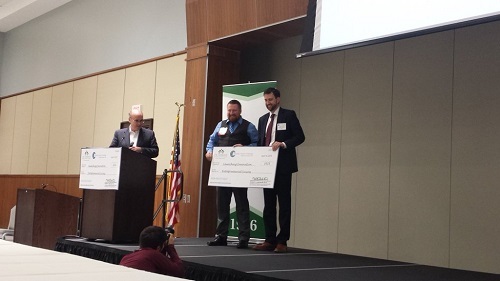 The Twitter post read as follows: “Grow Bioplastics wins grand prize at Charlotte Venture Challenge.” Here’s a picture of Co-Founder Tony Bova accepting the grand prize check. This is the second year that a Knoxville company won the event. Last year’s winner was General Graphene. And, this year was the first time that two Knoxville companies were invited to compete. The other was Innovasan. “While we did not win a large prize at the Rice competition, we really understood more about what made our business model attractive to investors, and I was able to incorporate that into the competition here,” Bova told us in an email last night. “We had five minutes to pitch and three minutes for questions, which really meant that I had to be very concise yet very compelling at the same time.